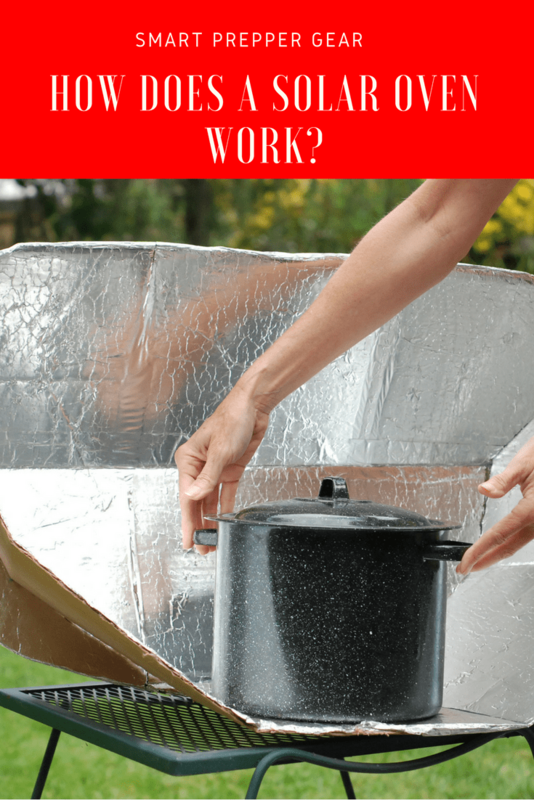 Home » Self Reliance » How Does a Solar Oven Work? Have you ever worn black clothes out in the sun during summer time? If yes, you would know exactly how it feels to get fried by the sun. That is, of course, not literally. Sunlight and sun rays are warm, but they aren’t hot enough to actually boil or fry or cook anything at all, let alone human meat. You cannot place a piece of ham out in the open and hope to have a well-cooked steak by the end of the day. However, there is a technology that can pretty much bring that thought to life. Imagine an oven that uses no energy, no fossil fuel, and cooks food with the help of sun rays alone! Sounds unreal, doesn’t it? Well, it isn’t. What you’re imagining is a solar oven. But how does a solar oven work? Is it even up to the mark? Let’s find out! How does a solar oven work if there is no source of energy? Well, the solar oven uses the sun as the energy source. Other than that, no sort of hassle is required. What sounds like magic is simple science. You might remember from secondary school how one form of energy converts to another. That is how fossil fuels work as well. Burning up logs of wood or petroleum or gasoline converts the initial form of energy into heat energy. The concept of how does a solar oven work is based on the same phenomenon. The sun rays are converted to heat energy by the solar oven which allows your food to be cooked like in a normal oven or stove. You literally need no source of energy at all! No electricity, no gas, and no fire. All you need is a pot with your ingredients ready to be placed in the oven. The simple answer to the question how does a solar oven work is that it uses the greenhouse effect to maintain optimum cooking temperatures. The hotter the weather is, the quicker your food will cook. Similarly, if it is windy, your food might take a tad bit longer. The mechanism of the solar oven is designed to work in pretty much any sort of weather condition as long as there is sunlight available. The inside of the solar oven has space where your pot can sit. The outside lining of the solar panel is made up of a material that is highly absorbent in terms of heat and sun rays but prevents heats loss too. The insides which are usually exposed upwards are lined with a reflective layer. The pot is placed between these reflective surfaces so that all sun rays can be directed to the pot for maximum energy. To make sure that heat doesn’t escape this system, there is a transparent lining. This prevents heat from escaping but at the same time, it allows sunlight to enter. These solar ovens can reach up to 200 degree Celsius or 400 degrees Fahrenheit. You need to make sure to regularly attend to the cooking food because if the sun is very bright, your food could burn as well! In such circumstances, minimize the cooking time and you’re good to go. Why is a solar oven the best traveling option? When you’re traveling, especially if it is a camping trip, you need to carry things with minimal weight but maximum utility. Solar oven checks both these requirements. It is a very lightweight device that can be easily carried around without any hassle whatsoever. The solar oven comes in a very portable design. It can be folded into a bag shape. Hang it on your shoulder and carry around the 1lb 2oz product easily. Along with being easy to travel with, it is also very easy to use. You do not have to worry about getting an electrical power supply in a camping site. Neither do you have to run around finding the perfectly dry wood to light. Lighting a fire is a task in itself. If the campsite doesn’t allow campfires, that is a whole new problem. You end up being forced to use either electricity or gasoline. Electricity is expensive and so is gasoline. You’ll need an appropriate burner too in case the campsite doesn’t have one already installed. Keep in mind you’ll have to pay for everything you use, from the energy supply to the burner you use. Adding all these costs up, it could force you to go out of the budget. With all of these issues on one side and having to open up a small, convenient bag and placing it under the sun on the other side, you clearly know the better option. All you need to carry is a pot, preferably dark in color. It is because dark colors absorb heat whereas white colors do not. Therefore, dark pots, especially those that are black in color, will aid the process of cooking inside the solar oven. Now you know how does a solar oven work and are also well-aware of the fact that it makes up the best source of cooking on camping trips. Wherever you are, if you can see the sun, you can cook food. It doesn’t matter if it rained and you cannot find dry wood, or if it is too windy to light a fire, or maybe you’re in a desert area where starting a fire isn’t suitable at all. A solar oven is cheap, it is travel-friendly, it is environment-friendly, it is safe, and it can cook pretty much anything! If that doesn’t convince you to take a solar oven to your camping trip, you probably plan on staying hungry throughout the vacation! How to cook in a solar oven? 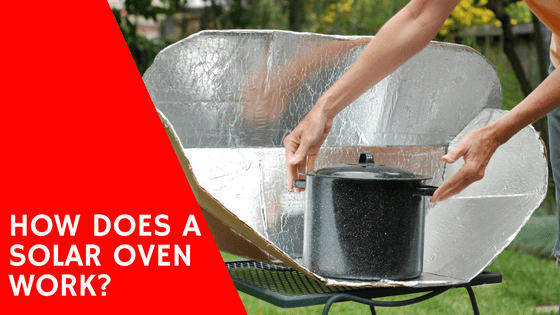 Now that the question of how does a solar oven work and why it makes the best traveling choice is out of the way, let’s find out what can be made in this magical device. Surprisingly, you can host a feast at your camping site if you carry a solar oven with you. From appetizers to main courses, desserts to snacks, your solar oven can cook you yummy food in no time. You can use your regular recipes. There is only a need to follow some basic guidelines to make sure you don’t end up with burnt or half-cooked food. Firstly, solar oven depends entirely on the sun. Therefore, the cooking time varies a lot. It could take longer on some days and on others, the food could cook much quicker. It all depends on the intensity of the sun. Therefore, you need to keep an open eye and keep checking the food. There isn’t really a risk of over-cooking under the sun which is why once every hour will be fine but you also don’t want to put the food out there and then forget about it, or else it could burn. You also need to start way ahead of time. For example, if you want to prepare a meal for your lunch time, start cooking in the morning. That is the ideal cooking time anyway since the sun isn’t very bright during evenings. The solar oven also won’t work during pitch black nights. You’ll find that the average cooking time for most meals is 2-3 hours on bright days. Buy a basic round pot with a lid. It will work with pretty much all your recipes. Majority of the times, solar oven meals are prepared with covered lids. If you’re just starting out, opt for easy meals like rice, chicken, or bake some kind of bread. Bake inside this oven like you would in a regular one, except that you don’t want to wrap anything inside aluminum foil at all. Just place the ingredients directly inside the dark pot. Keep in mind that the pot will be hot. Just like you wouldn’t grab the pot on a stove or inside a conventional oven, the same applies here. Although there isn’t steam or heat coming directly out of a solar oven, the pot is definitely at high temperatures. You need to reposition the solar oven every now and then. The sun rotates. It won’t keep casting the sunlight at the same angle. However, it is necessary for a solar oven to have direct sunrays falling over it. Keep rotating the solar oven so that there isn’t a time when the pot is under a shadow. There you have it! That is how a solar oven works and how you can make the most of it. It is a phenomenal idea that makes the perfect companion for preparedness and survival enthusiasts who also don’t want to compromise on food during their adventures. Get yourself a solar oven today to get rid of all camp food worries! Next: Is Canned Water Ideal for Your Emergency Supply?